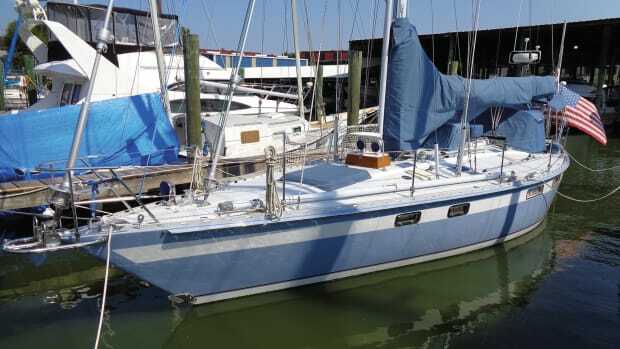 We were spending hurricane season in Trinidad on our Creekmore 34 Eurisko and thought we might as well haul her out to apply another coat of bottom paint. What we found when she emerged from the water on the lift at Peak’s Marina, however, turned a three-day quick haul into a three-month ordeal. We had blisters. Blisters can be caused by a number of things: a poor layup, portions of fiberglass that have been left unprotected or gelcoat that absorbs water. The initial cause is often unknown, since blisters can take years to grow big enough to catch your attention.  If a boat is hauled out every season, the blisters also have an opportunity to dry out, shrink and sometimes even completely disappear before the beginning of the next season. Unfortunately, Eurisko had been in the water continuously for years, and the few dime-sized blisters that had been noted during her survey now numbered in the thousands and were quarter-sized or bigger—some much bigger. We could no longer deny the fact that we had a problem. Knowing that grinding all the layers of bottom paint and gelcoat down to the bare fiberglass laminate was going to be a long, hot, miserable job, we decided to hire the yard for that part of the project—until we got a quote. I actually had to verify with the secretary who gave me the figure that she was quoting me in U.S. and not Trini dollars, because the amount was the same as what I would have expected to pay back in the States. Faced with such a hefty bill, my husband, Dave, decided to invest in a good grinder and teach himself to use it, a decision he soon regretted, if only for a few days. Wearing a Tyvek suit in the hot tropical summer sun, Dave ground through all Eurisko’s bottom paint and gelcoat. Because he was not proficient with a grinder when he started, he waited until the end to grind out the waterline. 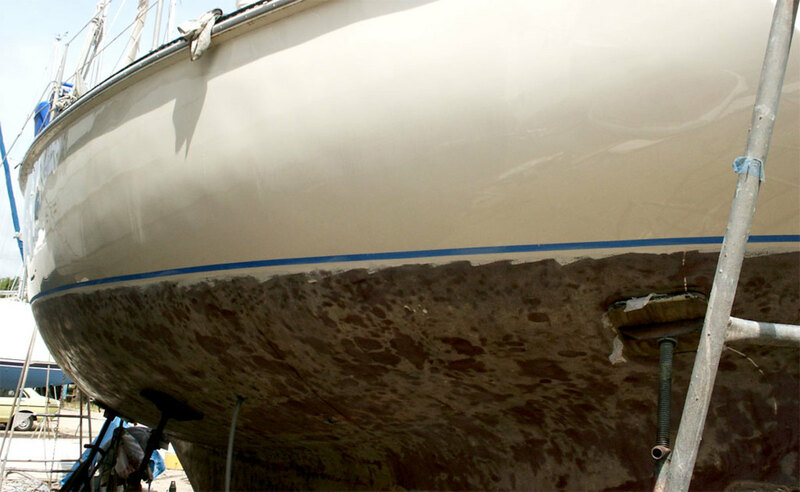 Before doing so, he double-taped the topsides about an inch above where the bottom paint stopped so that he would be able to apply a little extra barrier coat and ensure that no part of the bottom was left unprotected. 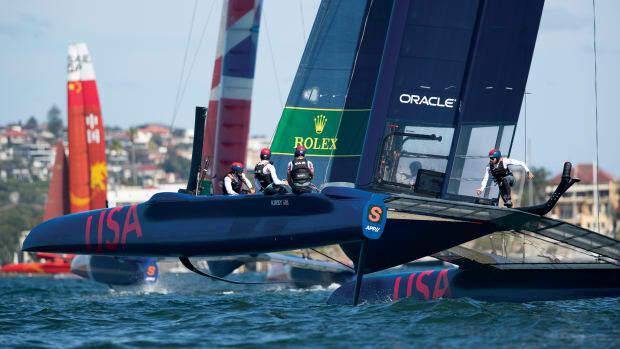 The decision was an easy one because we had already planned to paint the hull above the waterline while we were out. 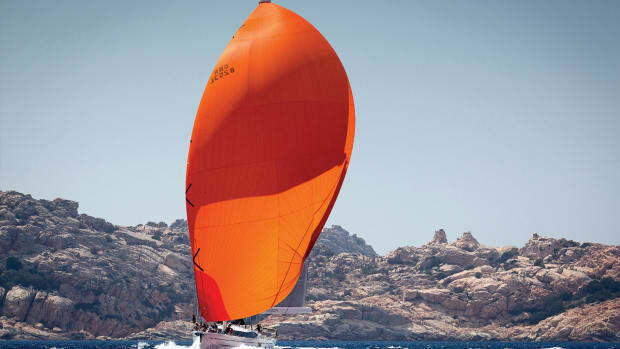 If you do not intend to paint the topsides, you will have to be that much more careful with your grinder. As he was grinding the bottom, Dave took particular care to dish out the blistered areas. Often there were large craters left where he had to remove a lot of fiberglass to grind out the blister. 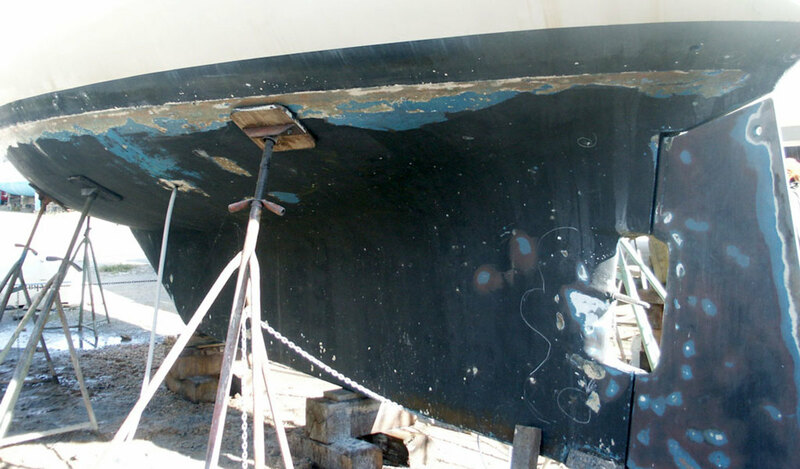 The fiberglass that needs to be removed will often be white, and when you rub your hand over it you will feel a bump where it sticks out slightly above the rest of the hull. 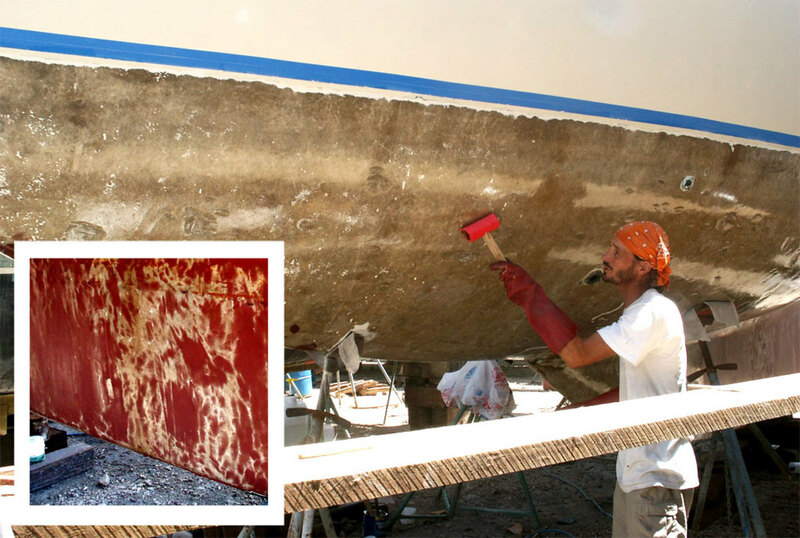 After grinding out the blisters, Dave thoroughly washed the hull with freshwater. Inside each blister there is a bit of styrene, which becomes trapped there when water reacts with the chemicals in the hull layup. When you first pop through a blister you can often smell it. Removing all the styrene from the hull and the craters left by the blisters will help the bottom dry out more quickly. Even if you remove every visible blister, there is a very real possibility that there are more you did not see. Fresh water and time on land will help dry out those blisters that you missed. 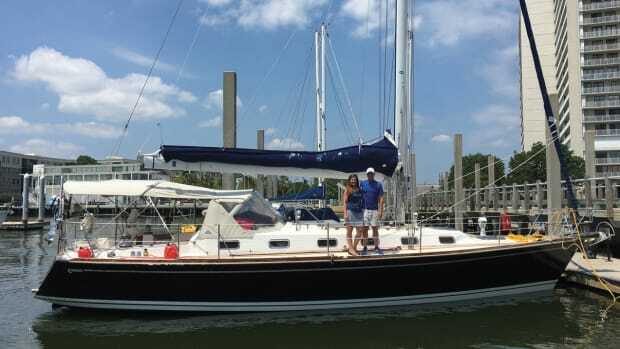 After the bottom was ground down, the blisters dished out and the hull washed, we began the hardest part of all: waiting. At $17 a day to stay in the yard, and with the nearest toilet a quarter-mile walk away, it wasn’t easy. But we did the best we could: our three boys made friends in the boatyard; Dave and I worked on various other boat projects; and the five of us used the time to do some sightseeing. Knowing that the longer we waited the drier the boat would be (and the less likely it was the blisters would return), we managed to tolerate living on the hard for three months. One of the projects we completed while we waited was prepping the topsides for paint. 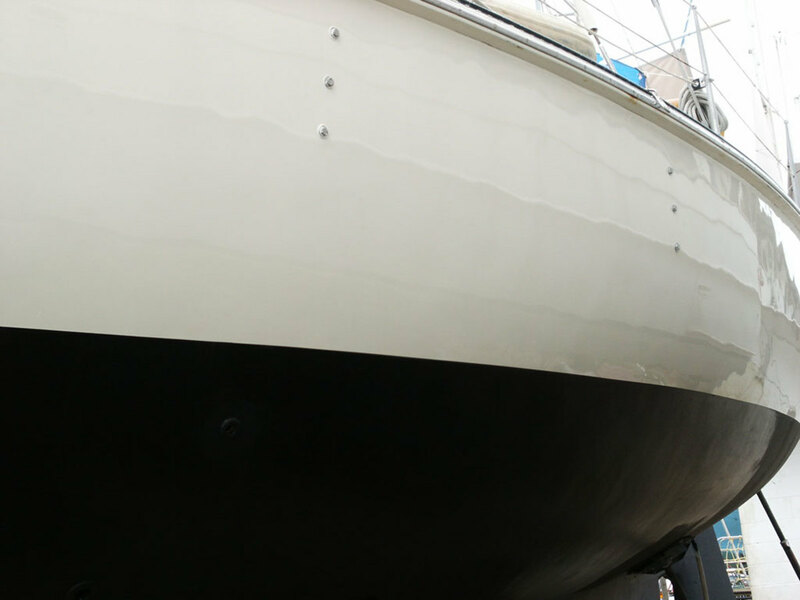 We planned to Awlgrip the hull, but we could not apply the paint until we’d applied the barrier coat, since we wanted to overlap the epoxy and the topside paint. 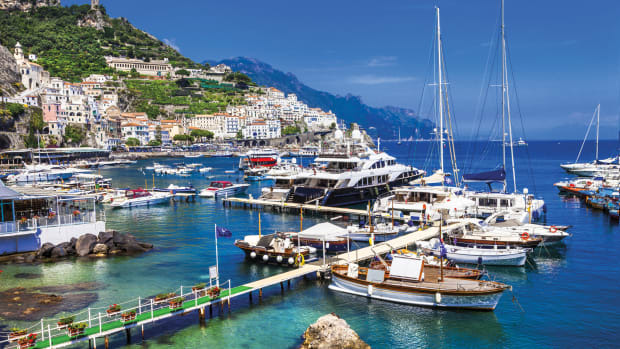 We had calculated that we would need about four gallons of epoxy to complete the project, and at the chandlery we found five gallons of 3:1 epoxy (similar to WEST System) for the same price as four one-gallon sets. (We ended up using almost the entire five gallons.) The day we decided to begin the project we encountered a number of delays, which meant Dave only had time to apply one coat of neat (unthickened) epoxy before the sun set. As a result, the next morning he had to wipe off the amines that had formed overnight as the epoxy cured and then scuff the epoxy before he could apply the fairing compound to the craters left by grinding out the blisters. 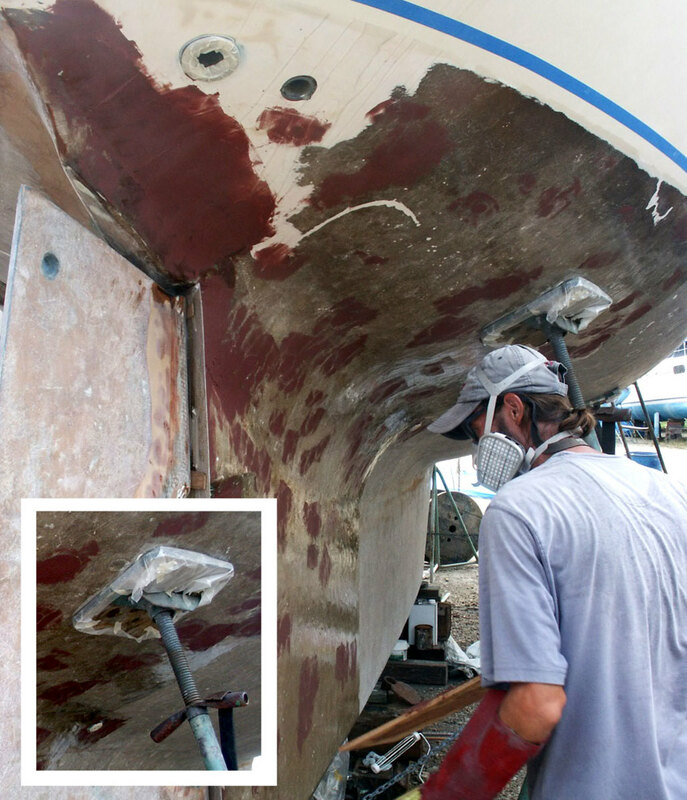 On the other side of the boat, Dave had time to use his preferred method: applying the wet-out coat of epoxy and then, while it is still green and not yet completely cured, applying the thickened epoxy to fair the hull. The result is a chemical bond rather than just a mechanical one. 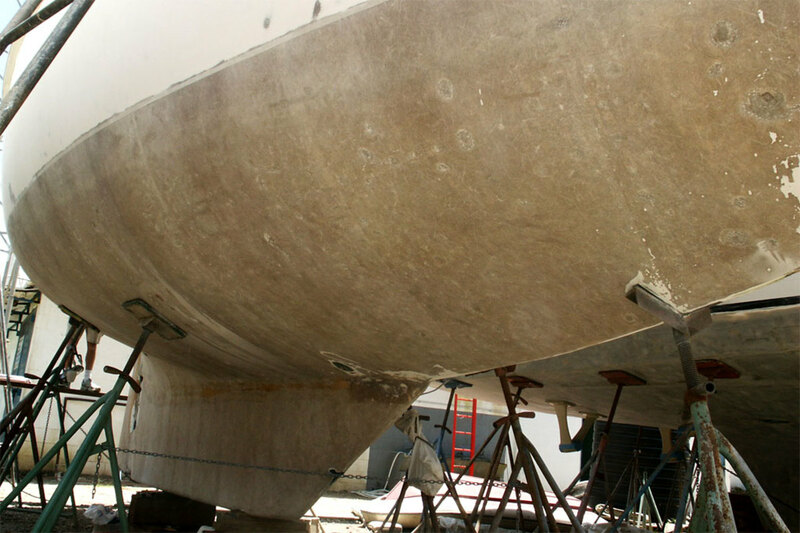 One hint about epoxying the entire hull: when moving jackstands to coat the fiberglass underneath, be sure to cover the pads with wax paper to keep them from sticking to the wet epoxy. For the fairing compound, Dave started by mixing neat epoxy. He then partially thickened this mixture by adding colloidal silica. Colloidal silica is very hard, adding strength to the fairing compound. Once the colloidal silica was completely mixed in, he gradually added phenolic microballoons, stirring until the mixture was the consistency of peanut butter. The microballoons add bulk to the compound, are fairly nonabsorbent and increase the sandability of the fairing mixture. Most fillers and epoxies work together, but heavily solvent-loaded resins may have compatibility problems. Using one company’s products is probably best. 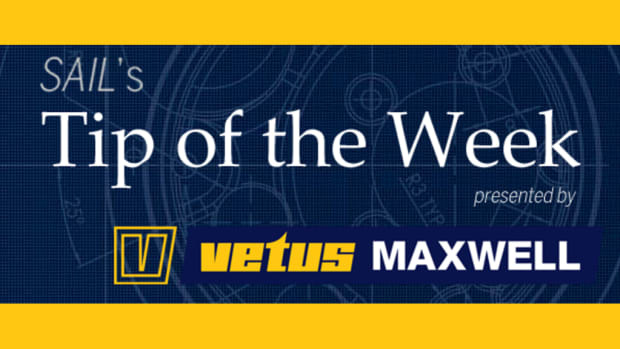 For sealing coats, WEST System has a 422 Barrier Coat Additive. After fairing each blister crater (they covered most of the bottom), we waited overnight for the fairing compound to cure and sanded the hull. Dave then repeated the fair, wait, sand, fair, wait, and sand cycle until he was (relatively) happy with the look and feel of the hull. After that came a final waterproof barrier coat of neat epoxy, a vital step when repairing blisters. Since four to six coats is recommended and applying each coat while the previous one is still green allows you to skip sanding between coats, we decided to apply as many coats as we could in one day. With me mixing epoxy and Dave rolling it on the hull, we were able to apply five coats before the sun set. To help speed things along, Dave made a small roller cover with a stick handle to “flatten” each coat of rolled epoxy after he had applied it with a larger roller. After the epoxy cured, we triple-taped a couple of inches below the tape we had applied earlier so that we had a line one inch below the waterline. We then rolled and tipped the Awlgrip down to this line, so that we could overlap the epoxy and topside paint. After the Awlgrip cured, we taped off the actual waterline to apply the bottom paint, so that Eurisko now has a one-inch strip of epoxy, Awlgrip and bottom paint all overlapping. After scuffing the epoxy with 100-grit sandpaper, we applied two coats of bottom paint—and with that Eurisko was both blister-free and ready for the water. 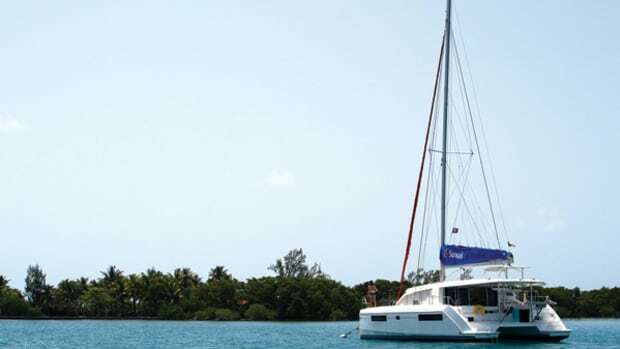 We had survived three summer months on the hard in Trinidad and were ready to go sailing.